On this day in 1947, Jackie Robinson broke Major League Baseball's color barrier, and the league now marks every April 15 as a day of celebration of diversity and tolerance in its sport. Baseball may still have a ways to go, however, and that is not just with its shocking decline in African-Americans playing the sport. Hank Aaron is one of baseball's all-time greats, and his record of 755 career home runs stood for 33 years before being broken by Barry Bonds in 2007. He is also an African-American. When Aaron broke the record in 1974 set by Babe Ruth at 715 home runs, he received death threats and was on the receiving end of a torrent of hateful messages. During a recent interview with USA Today on the 40th anniversary of the event, he said he not only said he keeps the messages as a reminder that America still has a ways to go in race relation, but he lambasted Republicans for the way they treat this country's first black president. Those comments have apparently set off a new torrent of hate mail for Aaron, USA Today reports, full of racial epithets and accusations of Aaron himself being a racist. 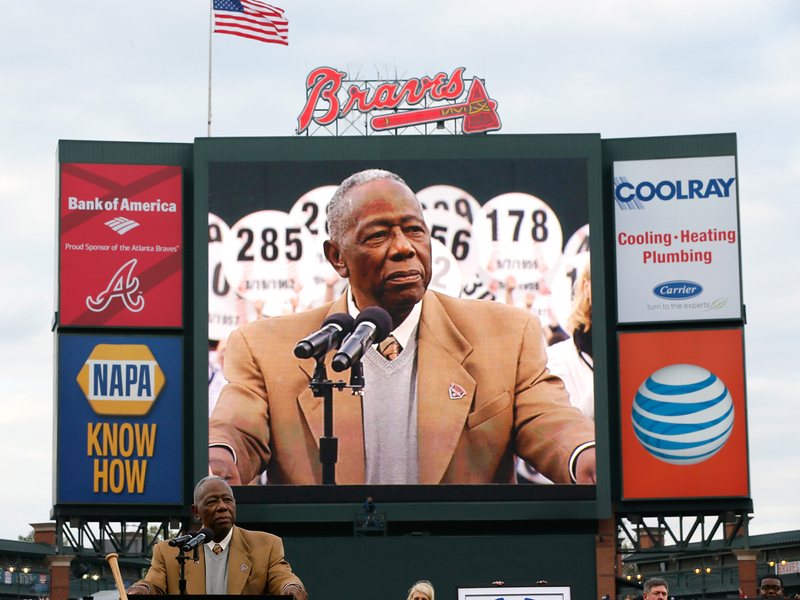 "Hank Aaron is a scumbag piece of (expletive) (racial slur)'' a man named Edward said in an e-mail to the Braves front office and obtained by USA TODAY Sports. "My old man instilled in my mind from a young age, the only good (racial slur) is a dead (racial slur)." When Aaron gave his initial interview with USA Today, he said that America's race relations "are not that far removed from when I was chasing the record. If you think that, you are fooling yourself. A lot of things have happened in this country, but we have so far to go." Aaron continued: "We can talk about baseball. Talk about politics. Sure, this country has a black president, but when you look at a black president, President Obama is left with his foot stuck in the mud from all of the Republicans with the way he's treated. We have moved in the right direction, and there have been improvements, but we still have a long ways to go in the country. The bigger difference is that back then they had hoods. Now they have neckties and starched shirts." Aaron speaking his mind was apparently too much for some baseball fans. Some of them promised to burn Aaron's book, others called him "classless, racist," according to USA Today. There has been no official response from either the MLB or the Braves as yet. Baseball has been working hard to improve the rapid decline in the number of African-Americans playing the sport, let alone watching it. In 1986, 19 percent of professional baseball players were African-Americans from the United States. On opening day in 2013, that number dropped to 8.5 percent, according to the Society for American Baseball Research. In addition to events like Jackie Robinson day, the MLB has also created a committee to study its decline in African-American players, and has invested heavily in urban youth development programs. In a recent CBS News poll, almost six in 10 Americans (59 percent) say race relations in this country are generally good, and just a third describes them as generally bad. These percentages are reversed from the 1990s, but have remained fairly consistent for the past few years. Positive views of race relations reached a high point in April 2009 when 66 percent said race relations were good. Whites and blacks are nearly in agreement in their views; majorities of both call race relations generally good (60 percent of whites, 55 percent of blacks).